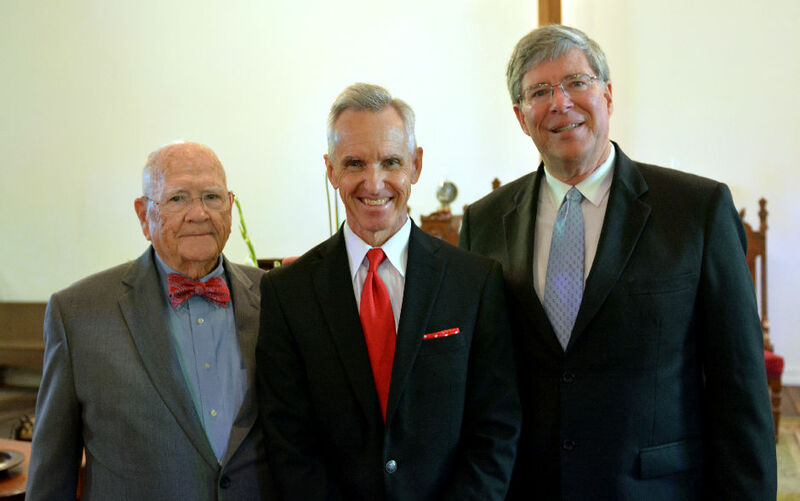 Sitting on a pew once notably occupied by Texas’ famous first President Sam Houston, Prestidge was joined by family and friends from Shiloh Terrace Baptist Church, his longtime church home. Jim Burgin and his wife, Debby, were also present to accept the Legacy Award on behalf of his mother, Tillie. Drawing from Jesus’ words in Matthew 25:23, Hardage preached about the faithful work of servants of the Lord. “We are really never more like Jesus than when we are in service to others,” Hardage said. He went on to talk about faithfulness as being who we are as Christians and “good” as what you do in service to God. “We are not saved by our good works, but we are called to do good works by doing good for others,” he continued. Tillie Burgin began Mission Arlington in 1986, following seven years of praying for the city she called home. What began as six Bible studies in apartments has turned into a 24/7 ministry including 349 different apartment congregations and more than 45,000 student volunteers that cycle through each year, learning and developing ministry skills. “I want to say ‘thank you’ to the Texas Baptists family – people in those early days who could hear God’s heart to help our city,” said Burgin, who serves as Director of Communications for Mission Arlington. Don McCall, retired director of Church Music for Texas Baptists, gave a moving tribute to Prestidge, his former boss. “Nobody in Texas Baptists history has ever accomplished what he accomplished. His ministry was a divine appointment from God,” McCall continued. Prestidge’s noteworthy accomplishments included establishing the Singing Men of Texas in 1975, the Texas Baptist All-State Choir in 1976, Texas Baptist All-State Band in 1978, Texas Baptist All-State Strings in 1994 and more. He held the position of Director of Church Music for 34 years, until his retirement in 1994. He is a member of Shiloh Terrace Baptist Church where he serves as Director of the Senior Adult Choir. “It’s not about I, it’s about we. It’s not about me, it’s about us. It’s not about mine, it’s about ours,” Prestidge said upon receipt of the award. He expressed thanks to his family, friends, congregation at Shiloh Terrace and his faith. “To God be the glory,” he said as the congregation rose to a standing ovation. The Texas Baptists Legacy Award began in 2013 and is annually presented during a worship service at Independence Baptist Church. Additional program participants included Tom Tillman, director of Music and Worship; Phil Hassell, pastor of Independence Baptist Church; John Ginn, pastor of Sulphur Bluff Baptist Church; and Naomi Taplin, assistant director of Texas Baptist Historical Collection.